When a man, Alabi Olokode, made advances to Lateefah Adesope, a National Diploma holder, the lady simply turned him down on the grounds that her heart was not with him. Like a desperate man that he is, Olokode persisted. But Lateefah maintained her stand. This, however, did not go down well with the desperate suitor. As usual, Lateefah set out for mosque around 5.30am on December 30, 2011, for her prayers. She said, “I was on my way to say my morning prayers at Tekunudeen Mosque, Aboru on Friday, December 30, 2011, when Olokode, who was hiding near the mosque, suddenly called my name. As I turned back, he poured a liquid substance on my face. “The liquid went straight into my eyes and started burning my face. At that time, I didn’t know it was acid but I just realised that I couldn’t open my eyes because of the burning sensation I was having. PUNCH Metro learnt that Lateefah was immediately rushed to the General Hospital, Oke-odo area of Lagos, where she was given first aid before she was transferred to the Lagos State University Teaching Hospital, Ikeja. It was learnt that after spending a few weeks at the LASUTH, Lateefah was told by the attending doctor that she would not be able to see again. Lateefah’s mother, Haulatu, who spoke to our correspondent amid tears, said she had to take her daughter to another hospital for a second opinion. She said, “Lateefah was given treatment at the LASUTH but we were not satisfied with their diagnosis because we felt the doctors there did not do enough. 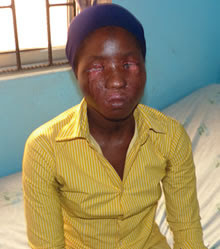 “The doctors at the LASUTH were able to take care of her to some extent and gave her some drugs to ease the pain but they later told us that she would not be able to see again. A nurse, who claimed to be part of the team that attended to Lateefah when she was brought to the eye centre, corroborated what the victim’s mother said. The nurse, who declined to give her name, said, “When Lateefah was brought in, her right eye was completely gone while the other one was glued together. “We had hoped that when we opened the left eye, it would still be functional but when we opened it, it was discovered that her cornea had been badly damaged and the acid had destroyed other vital parts of her eyes. However, the LASUTH management denied complicating Lateefah’s case and insisted that she was properly attended to. The Public Relations Officer, LASUTH, Mr. Dele Johnson, said the hospital remained one of the best in the country. He, however, took our correspondent to the Ophthalmology Department, where the supervising doctor explained that attempts were made to salvage Lateefah’s eyes. The doctor, who craved anonymity, said, “Lateefah was first taken to the Burn Unit where irrigation was done to clean her eyes and face of the acid. When Lateefah was brought in, the acid had damaged her eyes but we tried for weeks to salvage them. “We also did prodding by applying an ointment in her eyes to prevent them from closing and she could see partially within that period. Even during the strike, she was attended to day and night and there were improvements. Lateefah, who sobbed uncontrollably, told our correspondent that life had been unbearable ever since her ordeal. She said, “I didn’t offend Olokode in anyway, he had been making advances at me and I refused to date him. So, he decided to destroy my life. “I cannot see again, I have no fiancé, no child and all my dreams and aspirations seem like a fairytale. Her mother, who spoke amid tears, said the family had spent all their savings on medical bills. She said, “Olokode was a customer at my canteen and had been telling me since last year that he wanted to marry my daughter but I thought he was joking. “When he persisted, I told my daughter and she said she was not interested in him. I didn’t know he would go to such length to register his grievance. The Police Public Relations Officer, Mr. Joseph Jaiyeoba, said Olokode had been arrested. He said, “Policemen attached to the Oke-odo Division were able to arrest Olokode on Sunday following a tip-off. this is really a sad story!